We would like to announce our company name has changed from Cavill Power Products Pty Ltd to Cavpower Pty Ltd. Please note that this is a change in company name only and our ABN (22 007 735 300), banking details, postal addresses, email addresses etc remain unchanged. 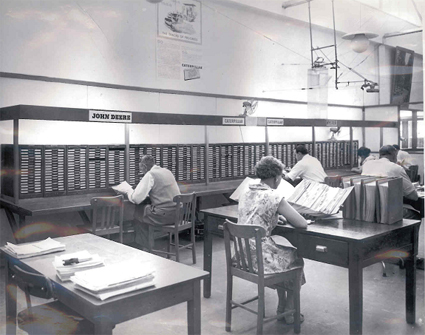 c. 1957 – Parts Department at Cavpower’s Head Office in Enfield. Today, our parts are located at our dedicated Parts Distribution Centre in Pooraka. Although our company name has changed, our commitment to ensuring the needs of our customers come first, remains unchanged. Our name change reflects our company’s ongoing transformation and signals our continuing dedication to serving our customers with exceptional products, service and solutions. This supports our company values and brand whilst reflecting a sense of change. Established in 1972 after taking over SA Tractor Company, Cavill Power Products became a Caterpillar dealership with around 50 employees. Our sustained growth over the years can be attributed to each of our dedicated employees and all our valued customers who need equipment that can work just as hard as they do. Today, Cavpower is still a local South Australian family-owned business with our Head Office located at the same premises. We have grown to a network of 13 locations around South Australia and in Broken Hill, New South Wales, employing around 500 local employees. Our growth has also seen the development of several dedicated facilities for key areas of our business, including a world-class Component Rebuild Centre and a dedicated Parts Distribution Centre and On-Highway Truck Centre. With over 45 years of business presence in the industry, we look forward to continuing to grow and to serving you under our new name. Cavpower has undertaken significant growth. The near future will see us continue to grow, as we focus on developing new solutions for our valued customers by enabling technology solutions and increasing innovation with machine data, whilst continuing to create an exceptional customer experience. We look forward to continuing to be your partner for long-term success. Cavpower’s world-class Component Rebuild Centre, officially opened in 2015, providing us the capability to service and repair major machine components and engines.